MAINSTREAM MEDIA CLUELESS AS USUAL AS HEADLINES FOCUS ON VIOLENCE AND SETTLEMENTS AS HURTING PEACE TALKS……. – The Tundra Tabloids……. MAINSTREAM MEDIA CLUELESS AS USUAL AS HEADLINES FOCUS ON VIOLENCE AND SETTLEMENTS AS HURTING PEACE TALKS……. Eh… no there isn’t any progress being made between the two sides. Being a realist about the situation demands a firm recognition that the Arabs are no where near ending their dirty terrorist war against the Jewish state of Israel. Let the Tundra Tabloids repeat that, they are no where near ending their dirty terrorist war against the Jewish state of Israel. What we are witnessing is a horse and pony show trotted out for the suckers in the media to fill their pages with something to print, because the Obama administration needs to have something, anything, happening in the diplomacy arena right now. Any casual observer should know by now that the faux presidency of Mahmoud “The Holocaust Trivializer” Abbas, is incredibly weak, ineffectual, and holds no real power. The PA is nothing more than an entity with a rip-off Jordanian flag, a cheesy anthem and absolutely no bargaining power whatsoever. A second day of peace talks between Israel and the Palestinian leadership was overshadowed by a sharp spike in violence as Israeli aircraft bombed the Gaza Strip and Palestinian militants stepped up rocket and mortar attacks. One Palestinian man was killed and three injured in the Israeli strike, which targeted tunnels used for smuggling on the border between Gaza, which is controlled by Hamas, the Islamist group, and Egypt. Gaza-based militants had earlier fired at least one rocket and eight mortars at Israel in an apparent attempt to disrupt the latest peace talks. Benjamin Netanyahu, the Israeli prime minister, and Mahmoud Abbas, the Palestinian Authority president, met in Jerusalem on Wednesday in a fresh attempt to break a deadlock over Jewish settlements in the occupied West Bank. The two leaders were again joined by Hillary Clinton, the US secretary of state, who stressed that the negotiations were making progress. She said the two sides were “getting down to business” and had started “to grapple with the core issues that can only be resolved through face-to-face negotiations”. There was, however, no sign of progress on the issue of Israel’s partial freeze on building in the settlements. The moratorium is due to expire at the end of the month and Israel has so far refused appeals to extend it. US diplomats had hoped to make headway on this and other issues this week before a series of Jewish holidays and the opening of the UN General Assembly in New York. Previous Post Previous Post TUNDRA TABLOIDS EXCLUSIVE: AMNESTY INTERNATIONAL FINLAND APOLOGIZES TO THE STATE OF ISRAEL……. 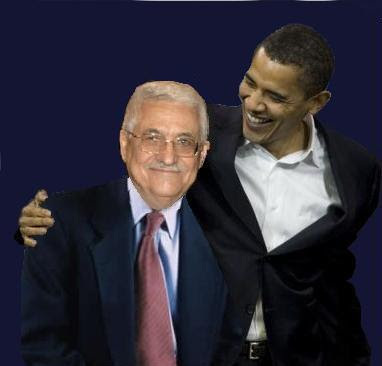 This photo of Abbas and Obama is a a strange one. Abbas appears quite human, while behind him is a malevolent Obama who reminds me of Dracula sizing up his victim. I feel a kind of common human sympathy for Abbas, just because he appears human. Am I being too imaginative?